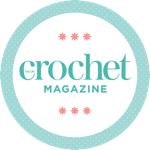 “I’ve really been enjoying getting to know different crochet stitches. I can now single, double, half treble and treble crochet, with different stitches on the same row! This month I’ve made the grey cushion from issue 59 [original pictured right], by Eva Wincent and Paula Hammerskog. I chose it because I love it, and Skandi is very on trend! “As you can see from the pictures, I have an issue with keeping the sides straight, and mine doesn’t look quite like the pattern picture of the original. Even so, I am delighted, I want to brag about how much fun it has been, how clever I feel and how lovely it looks on the chair in the lounge at home. I used Kettle Yarn Wimbledon DK in blues and greys, together with a cream DK from John Arbon, and I think the colours are beautiful together. It is a 1 star pattern, ideal for a beginner like me, easy to make, and the effect of the stripes is stunning! Did I say I want to brag about it?! Look out for more of Caroline’s projects over the coming months. You can visit Caroline’s Facebook group at www.facebook.com/gorgeousyarns and the Gorgeous Yarns Ravelry group at www.ravelry.com/groups/gorgeous-yarns. Sorry, there have been no comments on this blog post yet - why not be the first to leave your opinion?